All I Ever Wanted is the debut novel of Vikki Wakefield. Mim knows what she wants, and where she wants to go – anywhere but home, stuck in the suburbs with her mother who won’t get off the couch, and two brothers in prison. She’s set herself rules to live by, but she’s starting to break them. All I Ever Wanted really resonated with the teen in me. As teens we have big dreams of the future beyond our existing lives, leaping into the adult world where we can escape the restrictions of home and anything seems possible. Vikki Wakefield captures this teen feeling so authentically in her main character, Mim who others see as brave and fearless, but who has her own insecurities and dreams. Mim lives in a household where drugs are bought and sold, where classmates are intimidated by her family’s reputation. 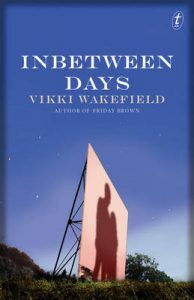 She fights against her upbringing and everything her family seems to represent. Her new friend Kate comes from a completely opposite background but she doesn’t fit in either. Mim makes life work by creating rules for herself that set her apart from the family she is being raised in. I will not turn out like my mother. But Mim discovers that her rules might not be practical in the real world and that her family are not as black and white as they seem. I like the way Mim makes new friends but is able to expand her circle to include her old ones as well. All I Ever Wanted is a powerful story told with reality and humour. 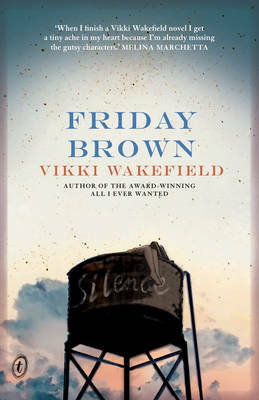 Vikki Wakefield combines page turning tension with beautiful language and setting descriptions so vivid that the reader feels they are sitting in Mim’s bedroom, sharing her life. The only corner that’s really mine has my bed, a three-legged bedside table and a dressing table with a mirrorless frame. I still have the Eiffel Tower quilt cover from my eleventh birthday and an original lava lamp that was Mum’s when she was a teenager. A World globe with a skewer stuck through it hangs above my bed by a strand of fishing line. The opposite corner is empty, but there’s a smoke blackened stain that flares up to the ceiling like a ghost, from when Tahnee and I set a toaster on fire after a night out. Only my bookcase stands new and tall, everything at right angles, each book in its place. 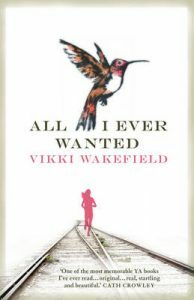 All I Ever Wanted is a gripping thriller with strands of first love and friendship deftly woven through it. It brings change, revelation and hope for main character, ‘almost seventeen-year-old’ Mim, and also for the reader.